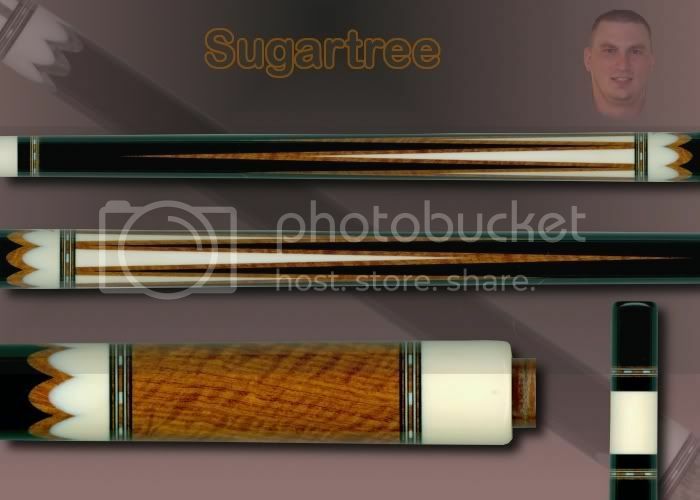 I know there has been much discussion about Sugartree cues here and on the other forum. I have known Eric Crisp for a little over 2 years now and I have a great amount of respect for him in the way he approaches cuemaking. He marches to the beat of his own drummer and builds cues the way he believes they should be built. He has a great deal of passion about wood, construction, playability, and quality of the product he produces. I believe the demand speaks for itself, like it or not. Eric and I have become good friends and we have talked about this cue for about a year and a half. I told Eric what I was looking for from a materials perspective, but I pretty much let him go on the overall design of the cue. I asked him not to send progress pictures because I wanted to be surprised with the finished product. I believe the outcome speaks for itself. Enjoy! very very very nice. White is ivory? Doesn't look like Ebony on Ebony???? The only deviation from Ebony on Ebony in my collection...and I'm OK with that... It has enough Ebony to satisfy my taste. yeah, i like that one, jamie! [quote="Worminator"]I know there has been much discussion about Sugartree cues here and on the other forum. I have known Eric Crisp for a little over 2 years now and I have a great amount of respect for him in the way he approaches cuemaking. He marches to the beat of his own drummer and builds cues the way he believes they should be built. He has a great deal of passion about wood, construction, playability, and quality of the product he produces. I believe the demand speaks for itself, like it or not. Thanks for sharing Jamie, that is a beautiful cue.